The SQL LIKE Operator is used to extract the records whose values are matching with the specified pattern. For example, If you forgot the Spelling of a Company or Product then you can use the Sql Server LIKE operator along with Wildcard to retrieve the required information. Here Wildcards will be helpful to replace the missing word. The SQL Wildcard percentage sign (%) represents zero or more characters. For example, the following Sql Server wildcard query returns all the Customers whose First name starts with Letter J. This Sql Server wildcard example display the Customers whose Occupation ends with Letter l.
The following Sql Server like wildcard query selects the Customers Whose Occupations starts with Letter M and ends with t.
The below query returns the Customers Whose Occupations contains Ma at any position. The Underscore sign (_) represents a Single character. For example, the following T-SQL query select all the Customers Whose First name has Second Letter o. The following SQL wildcard query display the Customers whose Yearly income contains 00 at the second and third position. The below SQL wildcard query display the Customers whose First name has at least four characters. The following query returns the Customers whose Yearly income starts with 8 and ends with 0. Here, we used three _ signs means, it will accept three numbers or words between 8 and 0. Use  (character list) to search for multiple items. 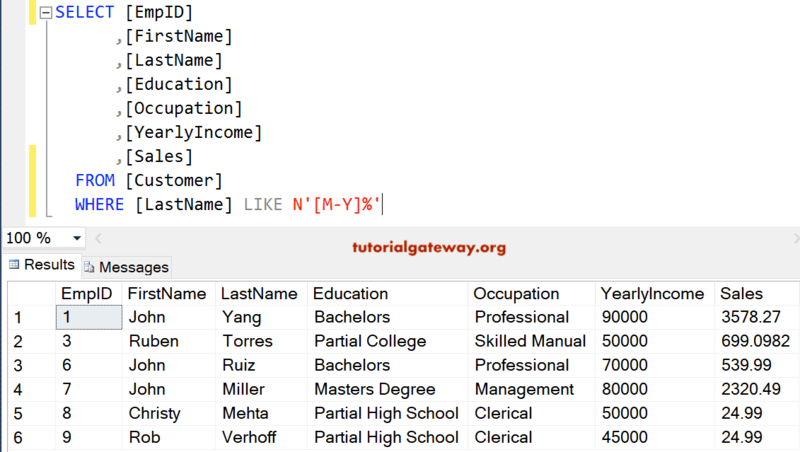 The following T-SQL query returns all the Customers in the Customers table Whose First name starts with either Letter C or J. This Sql Server like operator query returns the Customers whose First name does not start with either C or J. Use this character range in Sql Server like operator to search for a series of alphabets etc. For example, this query returns all the Customers from the Customers table whose Last name starts with any Letter between M and Y. This wildcard acts as the NOT LIKE operator. The following T-SQL query returns the Customers whose Last name doesn’t start with any Letter between M and Y. The SQL wildcard allows us to use the NOT Keyword as well. For example, below SQL server not like query shows the Customers whose First name doesn’t start with J. You can also write the above statement Using [^Character List] Wildcard. This SQL Not Like query shows the Customers whose First name doesn’t start with either Letter C or J. Below Sql Server Not Like query returns Customers table records whose Last name doesn’t start with Letters between M or Z. The following Sql Server Not Like query select the Customers from the Customers table Whose First name doesn’t have o in the second place. You can also use the SQL Wildcard characters like %, _ as the literal characters too. However, you have to do some extra work to achieve this.